Smartphones and tablets have become almost inseparable companions and very useful tools. 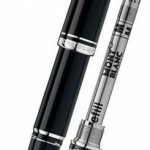 To use these devices with style, Montblanc has created Writing Instruments digital. 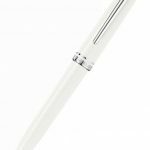 Inspired by the design of the Cruise Collection, Pix is compatible with products Samsung Galaxy Note and with their touch screen technology inductive to offer the best experience of digital writing. Mechanism: Roller with e-Refil. Features: Platinum-plated clip, Pix available Roller refill, platinum-plated, precious resin nera.In supplied rollerball tip. 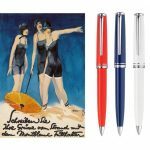 New collection Mont Blanc from the younger and more sparkling in three bright colors : blue , orange and white . Made of precious resin lucidissima.Finiture platinum . Available as ball rolling to € 185.00 and as roller cap to € 225.00 . First batch of production of the Cruise collection is complete , the orange, white and blue are no longer available . We are waiting for the new batch with output likely in May that provides for the renewal of the much loved and white the inclusion of blue and burgundy! Attention , only by us exclusively available in classic black Mont Blanc ! !